Well, this has been a year, hasn’t it? I look back on my eating habits in 2017 and find that I gravitated toward comfort foods in old familiar haunts – perhaps not the best thing to admit when you’re a food writer charged with exploring what’s new on the local scene. Yet it still wasn’t hard to remember dishes that surprised and delighted this year. There were dishes from familiar chefs stretching out in new directions, surprising bites in even more surprising locations, and one perfect croissant that won’t make this list because you can’t get it anymore – the pastry chef has left that particular building, leaving behind only some beautiful pastry memories. Bryan and Andrea Sikora’s newest restaurant is a quiet triumph. After opening three restaurants in Wilmington, the chef returned to Kennett Square with a menu that’s full of delight at a mid-range price point. My son ordered the bucatini the night we visited, and after a bite off his plate, I couldn’t stop myself from going back for more. (Sorry, kid, the Dad Tax hasn’t been repealed.) Robustly seasoned with deep, earthy flavors, this pasta dish is still on my mind six months later. 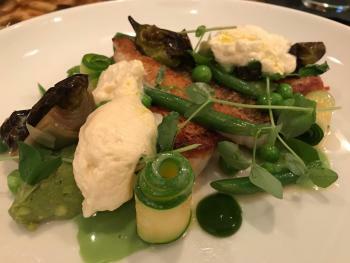 No one unearths more joy from the local harvest than Bill Hoffman, who created this explosively colorful plate of bass cheek and scallops with truffle avocado, shishito pepper, peas, zucchini, artichoke, green beans and a pickled shishito foam. Simple ingredients, prepared with incredible technical skill. Beautiful desserts at Robert Lhulier’s pop-up dinners are the cruelest desserts of all, because you can’t go back the next day to order more. 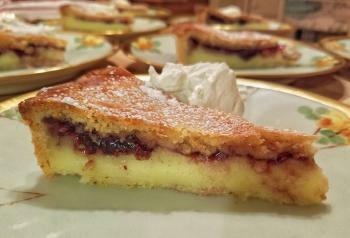 As chef told stories about his externship in Biarritz, I was busy stuffing my face with this beautiful slice of almond torte and its dark cherry confiture filling, brightened by the lemon zest in the crust. “Seriously, get hamachi kama.” That was the good advice that came to me in an urgent text from a friend when I checked in at Masamoto for the first time. Hamachi kama is yellowtail collar, lightly seasoned and slowly broiled until the skin is crispy and the delicate flesh is sweet and meltingly tender. Good advice indeed. When chef Dwain Kalup ran off to get married and sous chef Brent Chellew tagged along to be best man, the restaurant brought in some heavy hitting chefs to run the kitchen for a weekend of special dinners. 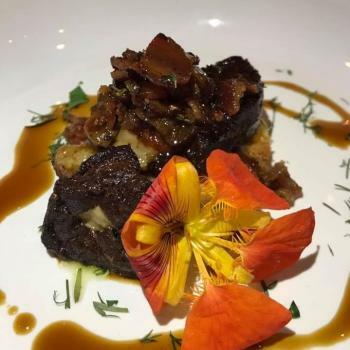 The night Patrick D’Amico was in the kitchen, he started with this melt-in-your-mouth foie with a bourbon bacon jam – salty, sweet, sticky and so good. My top burger in 2017 was served at the locovore-fueled Market Kitchen & Bar. 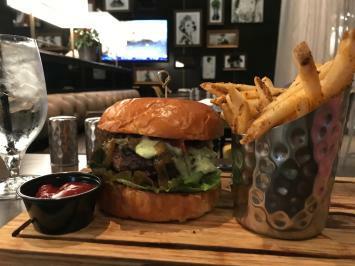 The Cow Tipping Burger stands tall with caramelized rosemary onions, house-made pepper bacon and an herb spread from the local Calkins Creamery. It’s too huge to eat neatly, but every messy bite tastes like burger should. You should never order the chicken gyro at the gyro place … except for this chicken gyro. At first bite, it’s uncommonly, uncomprehendingly delicious, with crispy yet tender chicken, beautifully spiced. This sandwich made me happy. The first-ever entry in this Good Taste blog praised the kale-bacon-maple hash at Drip. They went and improved on the original this year with a hash of heirloom pumpkin, maple-glazed pork belly, shaved Brussels sprouts and potato, topped with a sunny side up egg. If autumn arrived in a bowl, this is where you’d find it. It comes with two onion rings. You might not be able to finish the onion rings, but you’re damn sure going to finish the steak. Among a number of dry aged steaks that popped up on menus this year, Harry’s served the undisputed king. Chef Dwain Kalup’s skills are such that he can make me crave a raw squash salad. With fried almonds, peperonata, tomato miso vinaigrette and Parmesan on the plate, Dwain created a variety of textures and flavors that kept evolving as you ate your way across the plate. A wonderful surprise on a restaurant week menu, I was delighted with a dish I would not normally have ordered otherwise. 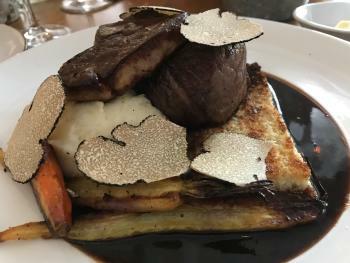 As a one-weekend-only special during OperaDelaware’s Spring Festival, this eponymous tribute to the great gourmand Gioachino Rossini could not have been more decadent, with foie and filet and truffles and presumably enough butter to stop the heart of the most burly baritone. 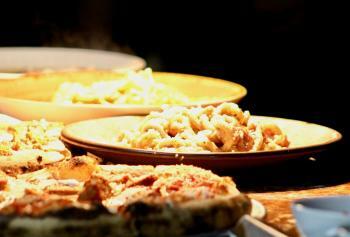 Does it represent Sikora’s light touch in the kitchen and the cuisine at La Fia? Not in the slightest, which made this brief flight into the fancies of the 19th century all the more fun.